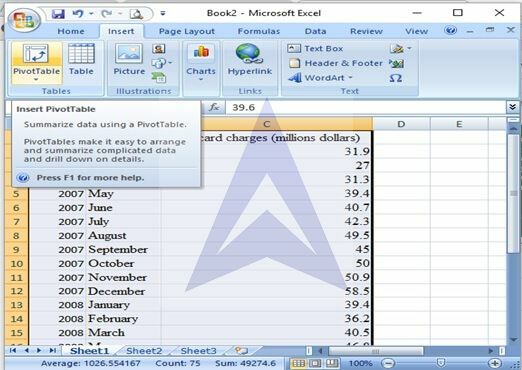 Copy the data and paste it into the Excel sheet. To construct the time series plot, select the data and go to Insert -> Line -> Line with marker. The following time series plot will be created. 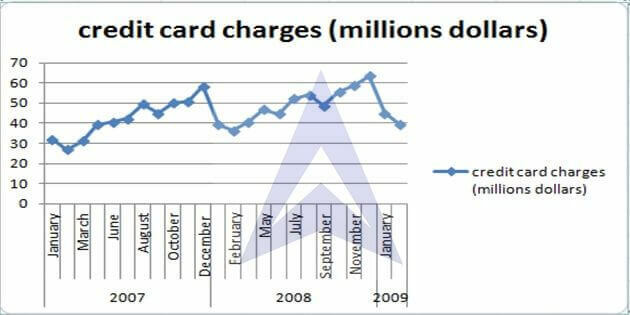 From the data, it can be observed that the credit card charges exhibit a rising trend over a one-year cycle. In the starting of the year the charges decline continuously in the month of January and February, reaching their lowest-in-the-year value in the month of February. After February, the charges pick up and continue to rise but dip once in September every year. In the month of December, the charges are highest. 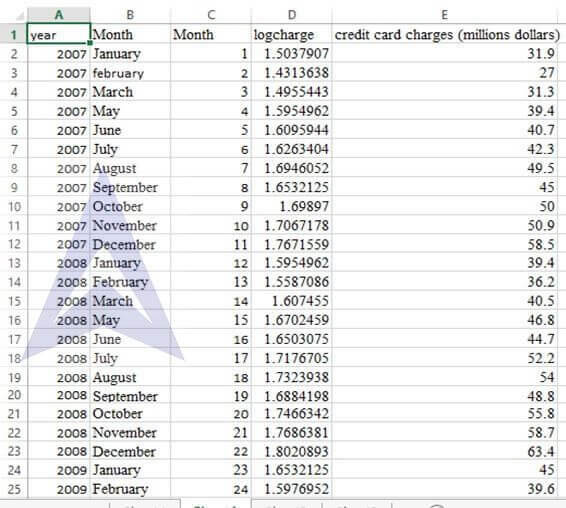 It can be observed that the overall charges are increasing every year, i.e., the charges in January 2009 are higher than those in January 2008, which in turn is higher than that in January 2007. Similar observation is made for all the months. Thus the data is depicting an upward sloping trend line overall, despite monthly fluctuations. D.	Note that December 2008 charges were more than $63 million, but those for February 2009 were less than $40 million. Was February’s total close to what you would have expected? 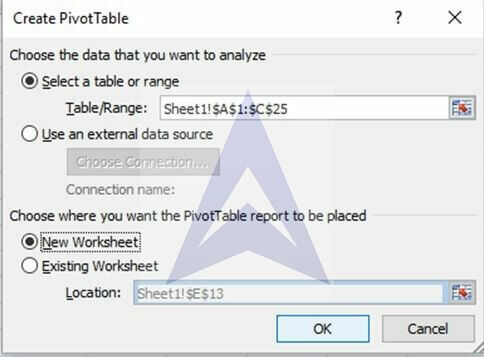 Step 2: In the Pivot Table dialog box, select the data range as A1 to C25. Step 5: In the Pivot table tools, go to Options -> Field Settings. 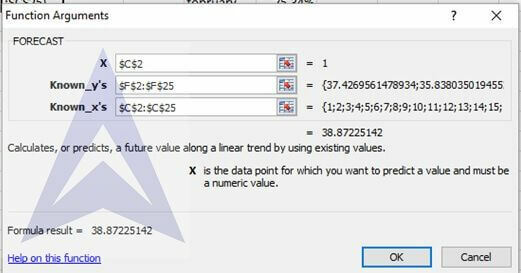 In the field settings tool box, under Summarize by, select the option ‘Average’ and under show values as, select the option of ‘% of total’. 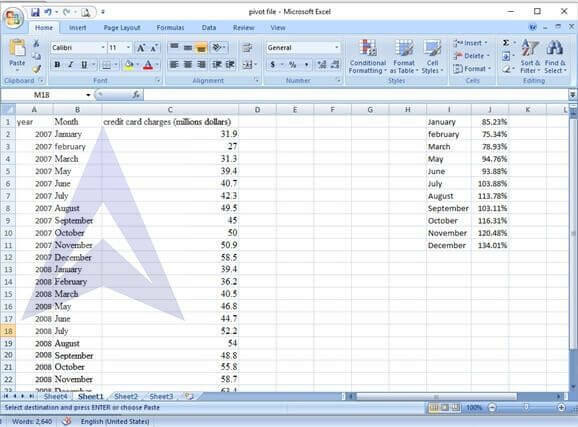 The following pivot table appears. 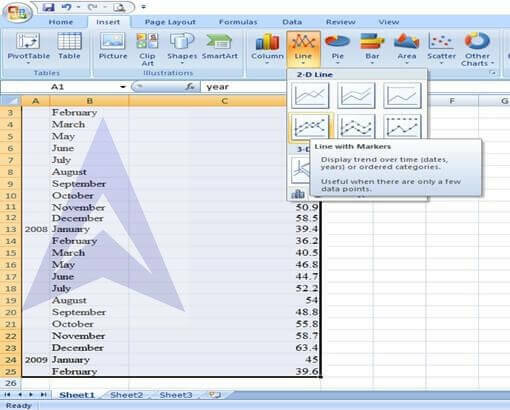 Step 6: For the purpose of pasting the monthly average seasonal index, unselect the option of years from the right panel. 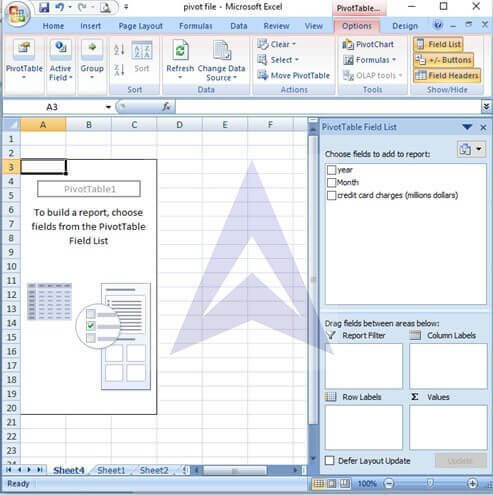 Copy the resultant pivot table to Sheet 1. Step 7: Paste the seasonal index against the corresponding month. 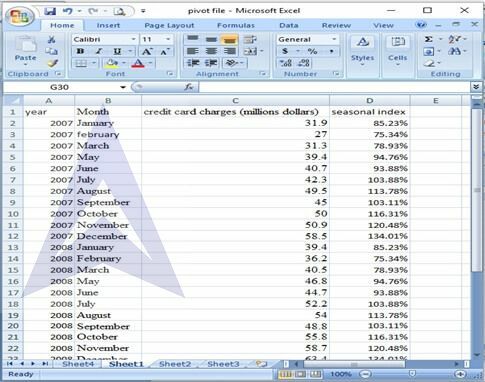 Step 8: De-seasonalize the data by dividing the credit card charges with the corresponding seasonal index. Step 9: insert a column to the left of credit card charge. In this column, number the observations. 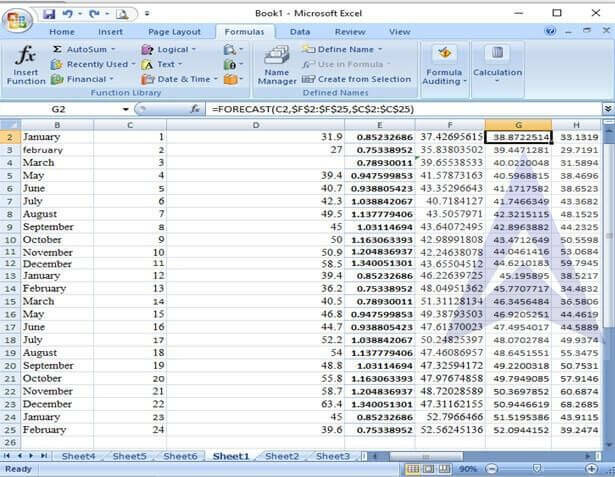 Go to Formula -> More Functions -> Statistical -> FORECAST. On the basis of the forecast, the value of credit card charge for February 2009 is 39.24. The actual value is 39.6. Therefore, it can be concluded that even though the charge was very high in December 2008, but, the charge in February is expected to be low because of the presence of seasonality. 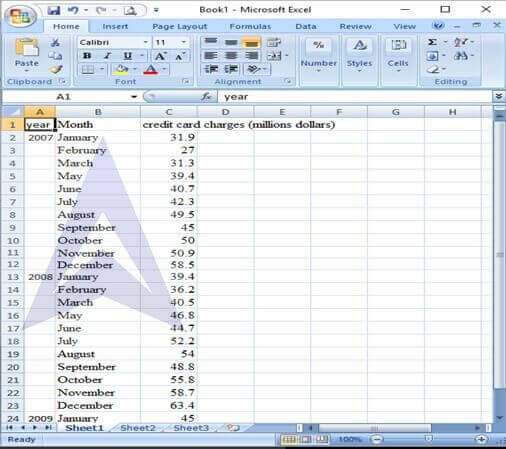 E. Develop an exponential trend forecasting equation with monthly components. 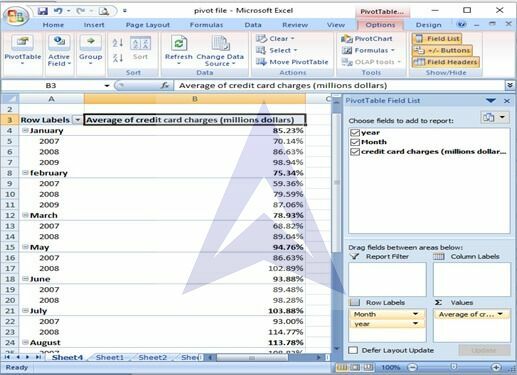 Step 1: Copy and paste data on excel and take log (base 10) of credit charge. 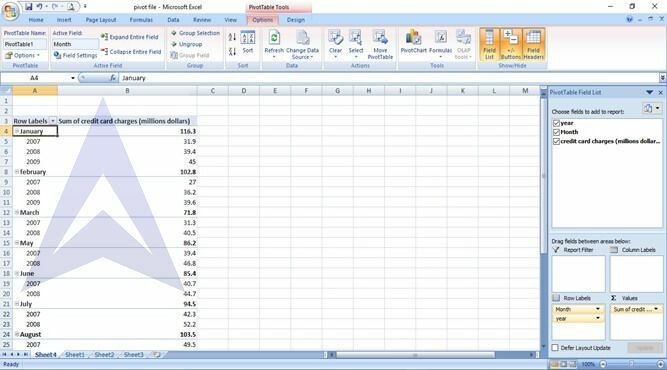 Step 2: Click on data and then click data analysis tool pack and select regression. For x values select cells C1 to C25 and for x values select cells D1 to D25. 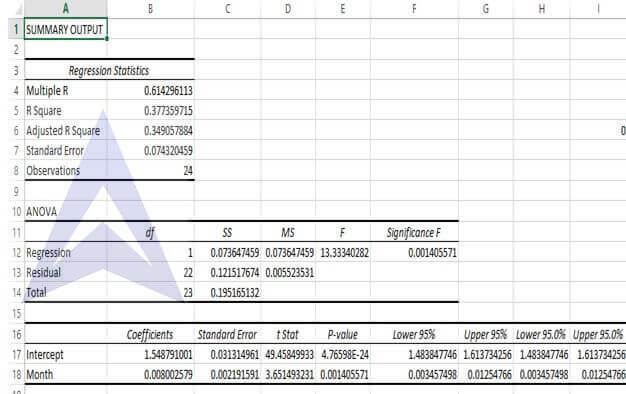 Regression summary is obtained. F. Interpret the monthly compound growth rate. The January multiplier is 0.8523 or 85.23% every January (see Pivot table output). 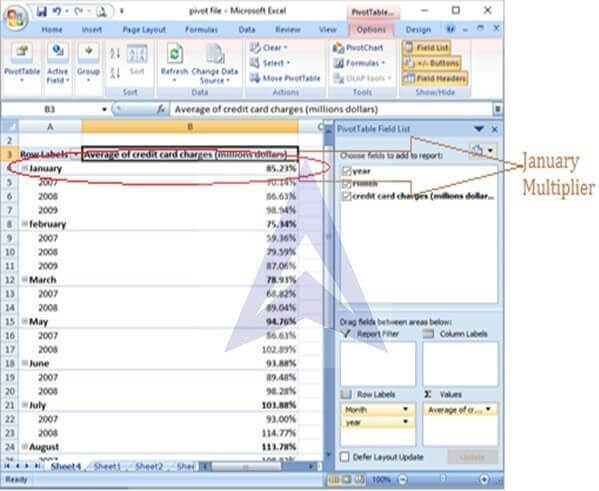 It mean that in the month of January, the charges are only 85.23% of the total annual average credit card charges. H. What is the predicted value for March 2009? I. 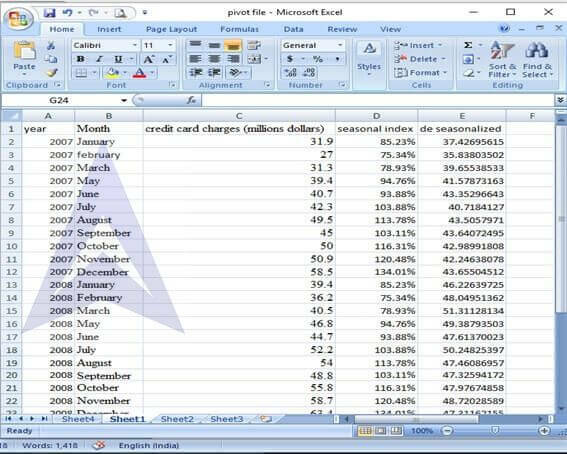 What is the predicted value for April 2009? J. How can this type of time-series forecasting benefit the bank? Time-series financial forecasting can help banks in analyzing potential portfolio decisions over a time horizon. Banks can conduct prediction of the future external economic environment as well as their own internal financial variables. Bank’s current financial position depends heavily on the previous decisions of deposits and funding as well as acquiring funds out of several investment opportunities of varying returns and time horizons. These decisions will also be affected by overall external economic environment as well as future expectations of financial and economic variables as well as expected targets for meeting management objectives. All these financial planning decisions can be optimized based on time-series forecasting of relevant economic and financial variables.